La Maison entre Mer et Montagnes was built in 1836 and is one of the first five houses in Cap-Chat. Its style will charm you, and you will love spending a night or more in one of its bedrooms. Welcome to a lovely cultural experience! 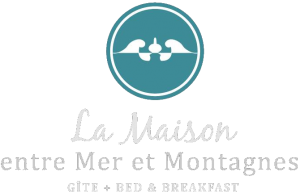 Not only have three of La Maison entre Mer et Montagnes’s five bedrooms (Le Phare, La Mer and La Riveraine) kept their original decorating style, but they also have a breathtaking view on the mouth of the Cap-Chat River, which flows into the St. Lawrence estuary (about 70km wide). You can walk to the rest area, and from there, walk on the beach, adding as many kilometres you want to and picking up all kinds of treasures: sea wood, sea glass, gemstones, and many more. From St-Jean-Baptiste Day (June 24th) to Thanksgiving Day (second Monday in October), Valmont restaurant, which is located 600m from the B&B, across the bridge, is open 8 days a week. And just like the rest area, it is at a walking distance from the B&B. We are located 15km (12 minutes) from Ste-Anne-des-Monts and 55Km (45 minutes) from Parc national de la Gaspésie’s Discovery and Visitors Centre. Two economy bedrooms are perfect for those who make a short-stay stop. These two bedrooms have got the 1950s decorating style and a double-size bed instead of a queen-size bed. Please, avoid booking only one night if you intend to go hiking in Parc national de la Gaspésie. It is also important that you keep in mind that La Maison entre Mer et Montagnes is 247km (3 hours, nonstop) from Gaspé (Parc national Forillon) and 307km from Percé (Parc national de l’Île-Bonaventure-et-du-Rocher-Percé), which are all part of la Pointe, the tourist area you will certainly want to visit after having explored the Haute-Gaspésie area (which ranges from Cap-Chat to Rivière-Madeleine). La Maison entre Mer et Montagnes was built in 1836 and was located directly on road 132, by the Cap-Chat River, close to the actual bridge. A proof of this is a picture hanging in the dining room. The house was moved away when the new Road 132 and the new bridge were built. La Maison entre Mer et Montagnes is one of the first five houses that were built in Cap-Chat. It belonged to the Roy family for five generations. In 2004, it was sold to a couple, who owned it for three years. Mrs Denise Ménard bought it in 2007 and started the B&B. She gave it its current name and ran it for eight years. Eager to pursue its mission, we bought the B&B in 2015 and started running it in June 2016. Every April and November, it’s Author’s Writing Month at the B&B. Those who want to experience a writing residence can choose between different packages. For more information, go to the Authors’ Writing Month section. Our guests share two bathrooms. Each one of them has a shower, a toilet and a sink. The one on the second floor—where the five bedrooms are— has also got a bathtub. Arrivals are between 4:00 pm and 10:30 pm. Check-out time is before 11:00 am. Not all the other accommodations in the region offer you such a flexible arrival time window. Free parking. Please park your car parallel to the road, on the lawn. You will be served a two-course meal. La Montagne bedroom (only via booking.com), offers you the option of the accommodation only, without breakfast. If, for any reason, you prefer not to eat our « Today’s Menu », there will be toast and cereal on the table for you. You can have breakfast any time you want until 10:00 am. Please note that we ask our early-bird guests to eat in silence if they choose to have breakfast before 7:00 am. We offer gluten-free, lactose-free and/or vegetarian breakfast menus. Please let us know of your preferences two days before your arrival. Although cooking is not allowed in our B&B, you can buy ready-made dishes and eat them in the dining room. We can also recommend you some affordable restaurants nearby. As it is the case for the majority of the restaurants in Quebec, the ones in the area serve meals until 8:30 pm (except fast-food chains). If you intend to get to the B&B late, we suggest you eat on your way. Your room is on the second floor. We can carry your luggage for you if it’s too difficult for you. Free. Pets are not allowed inside and outside the B&B. No smoking inside the B&B; smoking allowed outside. Cooking forbidden in the B&B.